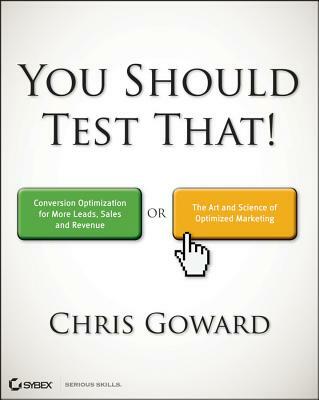 Part science and part art, conversion optimization is designed to turn visitors into customers. Carefully developed testing procedures are necessary to help you fine-tune images, headlines, navigation, colors, buttons, and every other element, creating a website that encourages visitors to take the action you seek. This book guides you through creating an optimization strategy that supports your business goals, using appropriate analytics tools, generating quality testing ideas, running online experiments, and making the adjustments that work. You Should Test That explains both the "why" and the "how" of conversion optimization, helping you maximize the value of your website. Chris Goward is founder and CEO of WiderFunnel, the conversion optimization agency that has improved marketing results by up to 400% for such firms as eBay, Google, BabyAge.com, SAP, Electronic Arts, Iron Mountain, Expensify, Hair Club, and many more. Chris is recognized as a conversion optimization thought leader, has an influential blog (WiderFunnel.com/blog), and speaks internationally at such conferences as Search Engine Strategies, Pubcon, eMetrics, Search Marketing Expo, European Conversion Summit, IIMA, Conversion Conference, and Internet Marketing Conference.